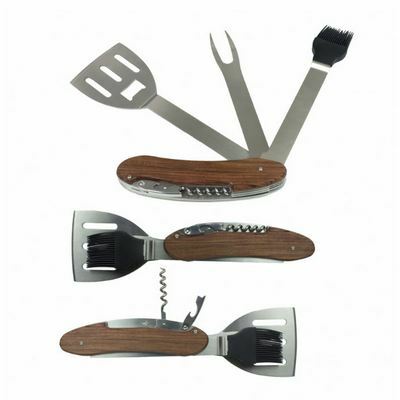 Everything the Grill Master needs in one innovative tool. Fork, Spatula, Silicone marinade brush, Bottle opener and Corkscrew. This rosewood handled tool divides into 2 parts when using then folds back into the handle and locks together for easy carrying. Making BBQ activities more fun, easy and convenient. Packed in a 2 piece matt black gift box. Product Size: 295 x 90 x 25 mm. Product Packing: Boxed. Decoration Size: 12 x 60mm. Decoration Position: Handle. Decoration Method: Laser Printing | Screen Print. Carton Quantities: 25. Carton Size: 39 x 33.5 x 19. Carton Weight: 18. Colour: Brown. Price includes : Laser Printing NA Colour / 1 Position. Setup is included.